What you’ll love about the Fountain top is its Grecian fine silk drape at the front that will immediately give you a classy style. 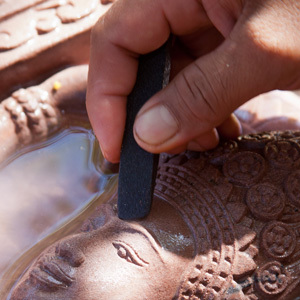 It was entirely made by hand by our talented craftsmen and women in traditional Cambodian workshops. 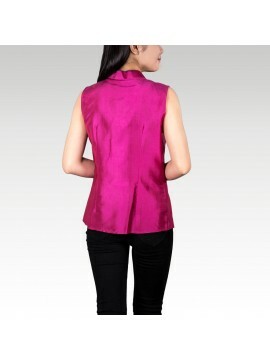 This casual chic Mao collar shirt is entirely made of Fine Silk. 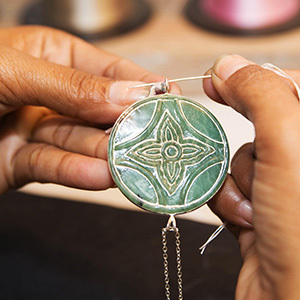 It can be worn in any occasion, casual or formal as it adds a stylish touch to anything else you will be wearing. The Long Sleeve Shirt is a wrap-around garment that can be worn at either formal or casual events. Wear a top that is of a similar color, this is the perfect outfit for those who are looking something a little more figure-flattering. 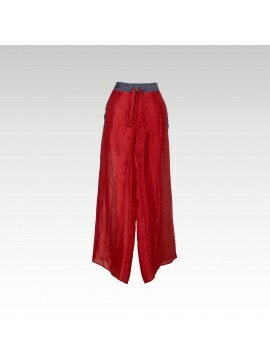 Our model is also wearing fine silk Wrap-Around pants. 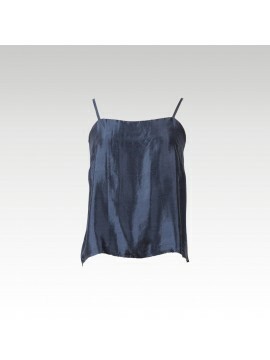 The Princess collar top is made of organza, the smoothest kind of silk ever. Just match it with a pair of jeans or cropped trousers, it will suit you amazingly. The Two Split Dress is a garment that presents both a very simple yet effective design. It is something which can be worn to evening dinners and other formal events, or even if you plan on going somewhere special for the day. The Cape dress is one of the finest pieces of silk clothing of the collection. It has been woven and sewn by hand by our crafty artisans in our workshops in Siem Reap province. This beautifully designed wrap-around dress has been created by hand by our artisans using pure silk threads; they were hand woven on traditional looms in our workshops in Siem Reap province in Cambodia. It is only available in the bicolor version shown on the picture, and it is available in three different sizes - small, medium and large. This Wrapped-Around Dress will not only help to create an ambiance of elegance, but it will also serve a practical function when getting dressed. Being a wrap-around with ribbons attached, it makes getting dressed quite simple and fast. This smooth and light bathrobe was totally handmade in silk organza in our workshops in Cambodia. It exists in two colors (sold separately): Mauve with a touch of charcoal and Charcoal with a touch of mauve. The airy Wrap-Around Pants are a great addition to a light and breezy outfit that can be worn during those warm summer days. They come in three colors and three sizes. This Princess pants is a trendy piece of clothing to add to your wardrobe. 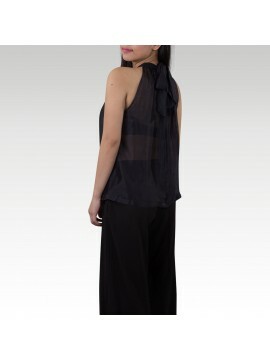 Not only is it fashionable, it is also super comfortable to wear since it is entirely made of fine organza silk. 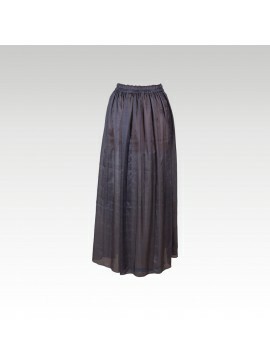 This smooth Elastic long skirt is perfect for summer times. It can be worn either as a skirt or as a bare shoulders dress with elasticized square neckline – self-tie shoulder straps are provided – and a shift silhouette. It was entirely hand woven and sewn by talented artisans working in traditional workshops located near the Angkor temples. This Ballon dress is made of fine Silk & Organza, and is to be worn for special occasions. It was hand woven on traditional looms by our talented artisans. Team it with a belt to accentuate your waist. 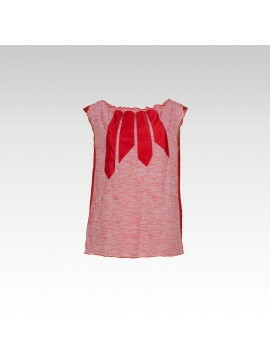 This casual chic Plastron tunic is made of Organza. It can be worn in any occasion, casual or formal as it adds a stylish touch to anything else you will be wearing! The Virgule Jersey top features a round neckline and short sleeves. It was entirely hand made from the combination of both jersey and fine silk, by craftsmen and craftswomen working in our traditional workshops located near the Angkor temples. Want to add a colorful touch to your outfit? 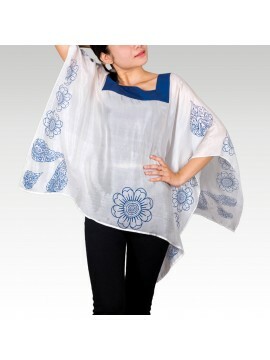 Wear this Kaftan short tunic. 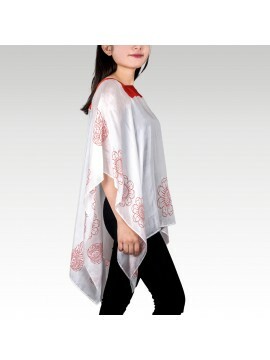 It is totally handmade in fine silk and can adapt to all kinds of body shapes. The reversible sleeves will be a great match with your accessories and/or trousers. The Print Cape was entirely made of fine silk. 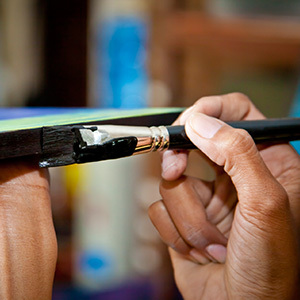 It was hand woven by our craftsmen and women on traditional wooden looms in Cambodian rural workshops. Combine it with our Wrap-Around Pants or soft and light Elastic Long Skirt! The Lily Lace top features a mock neckline, a cutout back with silk ribbon closure. Entirely made of fine organza silk ornamented with lace decorations, it is a must for any woman who wants to be stylish during spring and summer time. Its sleeveless designs gives it a sensual look while the flower lace adds a romantic touch. The Coco raglan dress was entirely made by hand – the fine silk fabric that it features was entirely hand woven in Cambodian traditional workshops, and the discreet ceramic pearls that are tied to its sleeves were also molded by our gifted craftsmen and women. 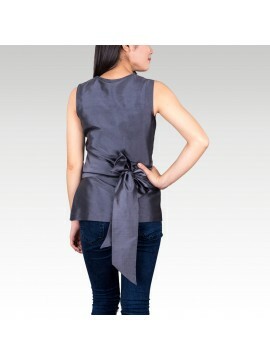 It features a square neck along with a classy ribbon tie. This very comfortable Moon pants is made of Organza. 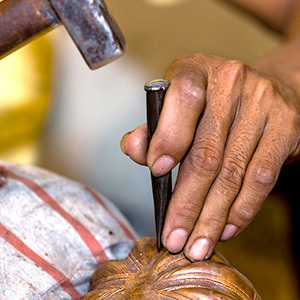 It was entirely hand woven and sewn by our artisans in our traditional workshops. The perfect casual touch for Sunday afternoons and dinners at home. 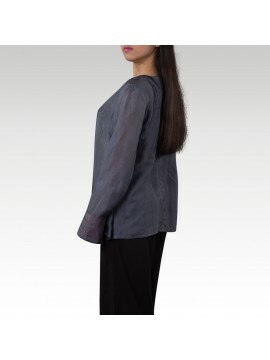 This comfortable Smock blouse is made of Organza. It was entirely hand woven and sewn by our artisans in our traditional workshops. Cut an off-shoulder silhouette - one of the most flattering trends of the season - this bohemian style features softly crumpled silk flowers and an elastic thanks to which it will always look perfect. 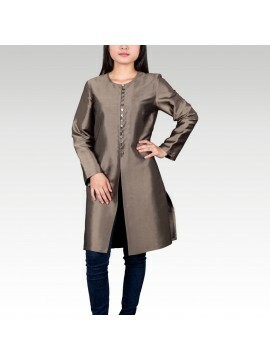 The Coat dress is made of Fine Silk and is the perfect elegant touch for transitional seasons! 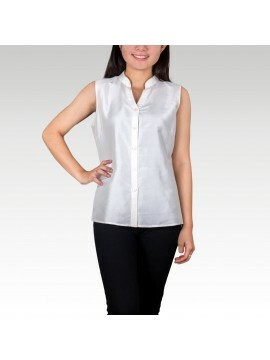 The Sleeveless shirt is a chic, elevated piece that will become staple in your wardrobe. 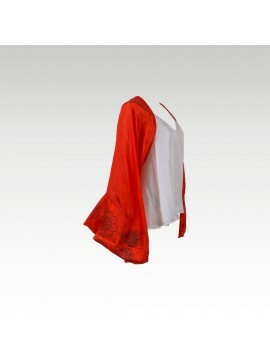 This shirt is entirely made of Fine Silk, and was hand woven and sewn in traditional rural workshops. This short top was entirely made of finest and softest silk by our talented craftsmen and women in traditional Cambodian workshops. You will love wearing it on any occasion. 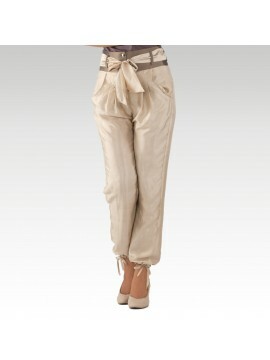 Our model is also wearing fine silk Wrap-Around pants.